USLHS Warning sign pre 1930's. 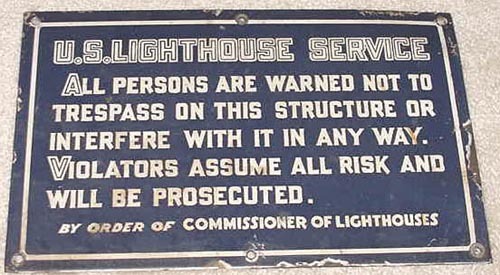 Property markers and warning signs played a small role in the lighthouse service. Lighthouses were government property and were important in keeping the mariner safe at sea, so lighthouse reservations were marked and surveyed. Surveys were conducted, plot plans drawn out and monuments placed at the property boundaries. Properties were marked with no trespassing signs to warn people they were entering government property. Monuments were cement, limestone or concrete posts made to mark the properties four corners. These monuments were typically 3 feet high and had USLHE or USLHS engraved, cut or ground out from the small column made from limestone or other stone. These were important reference points for the property line and helped tell people where the lighthouse reservation was. It also helped for future expansion of the reservation also so lines could be easily seen and surveyed again. See the plot plan below that references the monuments. Many of these monuments have not survived through the years. When we get an opportunity to photograph one or acquire one we will post it here. 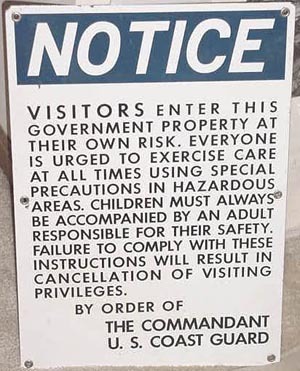 Warning signs have also not survived the years well. Like other lighthouse marked items, many were thrown away and discarded when the Coast Guard took over. 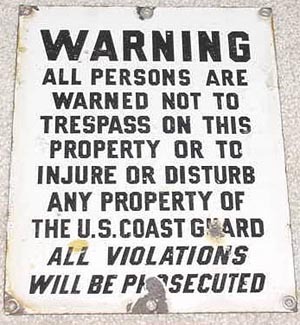 Warning signs were posted on pier lights, around lighthouse property and even on fence post's for example. A few different sizes have been noted through the years depending on the use required. The signs pictured here are signs that were used over the years from the Lighthouse Service to the modern day Cost Guard. Visitors were encouraged at lighthouse property as noted in many vintage photographs and in the Instructions to Light Keeper's manual. Light keepers were expected to show hospitality towards visitors so long as it didn't interfere with their duties as Light Keepers. 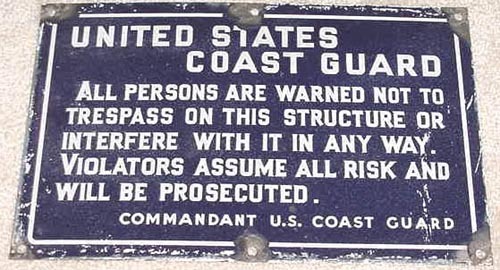 USCG Warning sign circa 1940's to 1950's. Lighthouse property plot plan showing the house, walkway, oil house and out house marked on this drawing. Property monuments are noted on this drawing.